Hus also rejected the power and authority of the Pope, and while at a meeting to discuss his views in 1415 was arrested and burnt at the stake for his “heresy.” The council also took the opportunity to proclaim Wycliffe a heretic, even though he had been dead for almost 40 years. In fact, they dug up his bones and burnt them in contempt for his teaching and its influence on Hus. The name Hus means “goose.” In the 100 years from 1415 to the early 1500s another man came on the scene, a man whose family crest was the picture of a swan. That man was Martin Luther. In the years between Hus and Luther there arose another figure of great importance, William Tyndale. He learned Greek so that he might translate the Word of God in the New Testament from the original language into English. 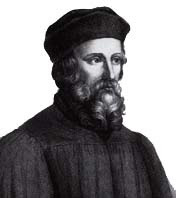 You and I have our Bibles today because of the perseverance and hard work of William Tyndale. His English New Testament is certainly one of the most important books ever published in the English language. 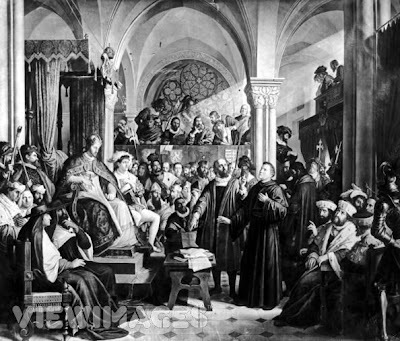 As the Word of God spread, and God continued moving upon men to proclaim the truth of the gospel, on the Eve of All Saints Day, October 31, 1517, (Reformation Day), a momentous and incredible event took place at the Church in Wittenberg, Germany, in fulfillment of Hus’ dying declaration. There this Roman Catholic monk named Martin Luther, the swan, challenged the leaders of the church that had burned the goose to a debate. He did so in the form of a protest. As Luther reacted against and protested the selling of indulgences (money paid to the church for the forgiveness of sins) and many other abuses by the church – things that he saw the church doing that clearly contradicted the teachings of Holy Scripture – he made a list. 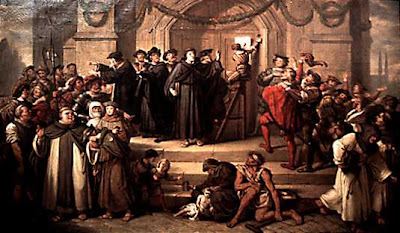 His list of 95 offenses or abuses, which are referred to as Luther’s 95 Theses was an indictment of the church and many of its tradition and practices.